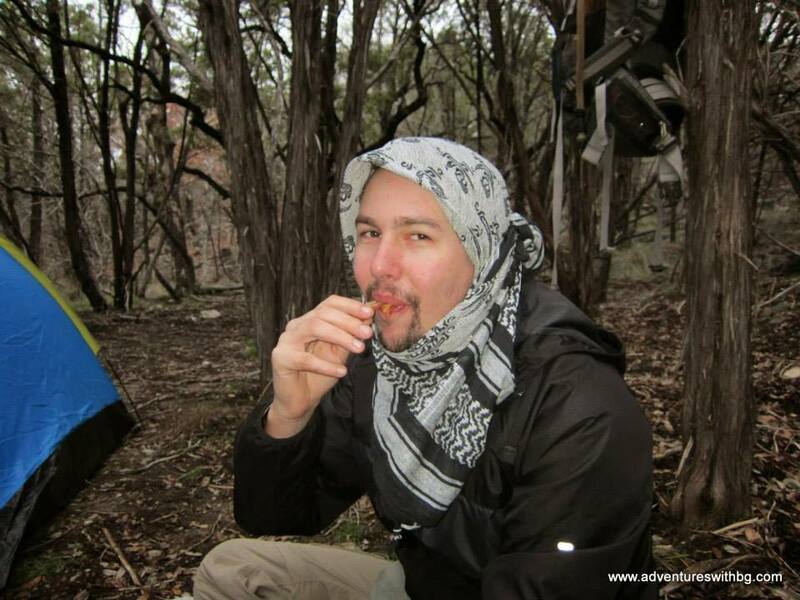 On a previous hike to Pedernales Falls State Park, I brought along some CMMG Tactical bacon in a can. 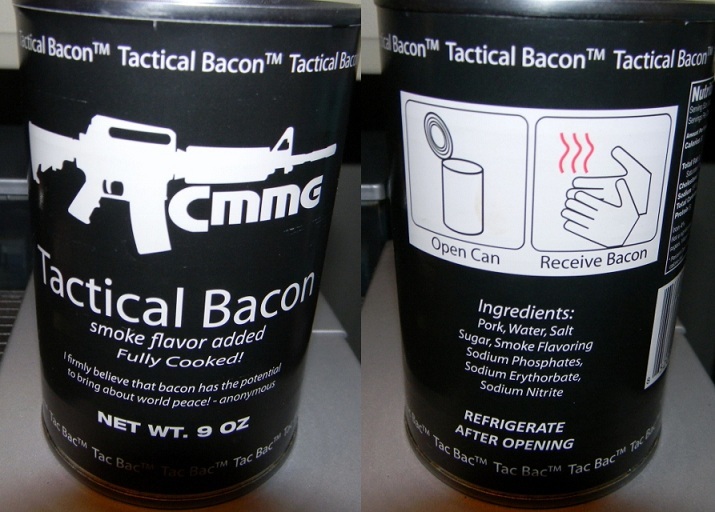 Tactical bacon is fully cooked bacon with added smoke flavor that is conveniently placed in a, you guessed it, can. It is manufactured by CMMG, which is a company that builds and sells firearms. The can has about fifty thin slices of bacon in it and weighs around 9oz. The product has a long shelf life, lasting around 10 years. Canned bacon is great for camping in the great outdoors, the zombie apocalypse, or just around the house because you love bacon just as much as BeeGee and I do. I ended up buying the tactical bacon because I love bacon and I wanted to take some backpacking to see if it was completely awesome or just regular awesome. The weight was great for me at only 9 oz., but some might find this too heavy for just a portion of a meal. However, 9 oz. gets you around fifty slices of bacon, which could easily feed a family of four. The size was all right it is about three inches by four inches, which is not the best size for you pack but I was able to make do. You can’t get a much better tasting treat in a can. I mean come on, it's bacon in a can. It makes what I would call a blissful day in adventure paradise. On the down side, there was a white grease that had an odd flavor, but all in all its bacon, which means it is yummy just like all bacon is. I also think the white grease wouldn’t be an issue or in warmer temperatures. Plus it didn’t help that we ate the bacon without heating it. Me chowing down on some bacon! It turns out, getting to the bacon was very difficult without a can opener. I always carry my trust P38 can opener with me, but I’m really bad at using it. So, it ended up taking me about fifteen minutes to finally get to my bacon. I really wish CMMG would incorporate a pull-tab on the lid for much easier opening. It would also be nice if CMMG made different sized cans, so I could have taken a can that served 2 people instead of 4. Overall, I think CMMG makes a good product, but with a big con. The price of a single can tactical bacon is 19.99, which is an okay price for the novelty. However, this is much too expensive for practical and frequent adventure use. The poor delivery system is my biggest problem with the product. While, It doesn’t kill me to use a can opener but it wouldn't hurt to put a pull tab on the lid. All in all, I would give it four stars only because there are cheaper products that are very similar with the pull tab delivery system. If you've ever had Tactical Bacon, let me know your thoughts or where to find the best hiking bacon? Make sure to keep up to date on all our adventures by following us on Facebook.